Ruthven was one of four infantry barracks built across the Highlands by George II’s government following the failed 1715 Jacobite Rising. The others were at Kiliwhimen (now Fort Augustus), Bernera, Glenelg and Inversnaid. Their purpose was to house regular troops outposted from the main garrisons at Fort William, Fort George near Inverness, Edinburgh Castle and Stirling Castle. The troops were to forestall a future uprising, maintain law and order locally, and enforce the Disarming Act of 1716. 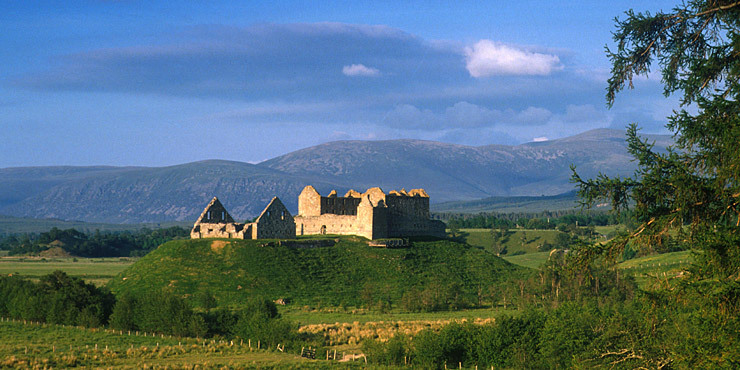 Ruthven Barracks was built between 1719 and 1721, on a prominent mound that had once been the site of a medieval castle of the Comyns, and later the Gordons. A separate stables block was added in 1734, on Major General Wade’s orders, for use by dragoons protecting troops marching along the adjacent military road. Ruthven was put to the test twice, during the last Jacobite Rising of 1745–6. Following their defeat at Culloden, the Jacobite army rallied at Ruthven before conceding defeat and going their separate ways.